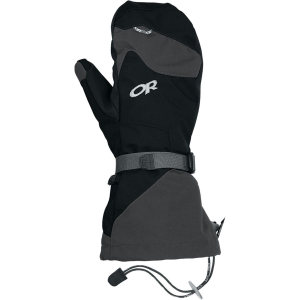 Good glove/mitt hybrid that is a great base for a waterproof winter glove layering system. 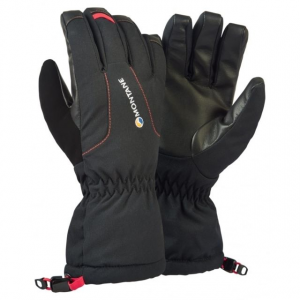 The Black Diamond Lobster is a cross between a glove and a mitt, and is a great base for a waterproof winter glove layering system. 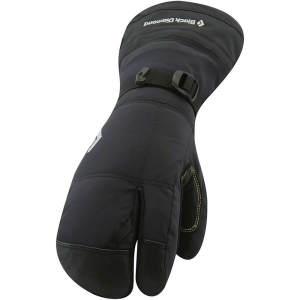 The lobster design is warmer than a glove, but gives you more dexterity than a mitt. It has a thumb and index finger, and a separate section for the rest of the fingers. When it is cold, I can fit my index finger into the mitt section for possible extra warmth. When you want to hold trekking poles, mitts are still doable, but with an ice axe the lobster design is way more useful. I have used other waterproof shell full mitts over my gloves but found myself taking them on and off for every little task imaginable. The lobster design is truly best of both worlds. I could do way more than with a mitt (open bottles, adjusting crampon straps, handling zippers), while being warmer and they are easier to take on and off than many tighter fitting gloves. 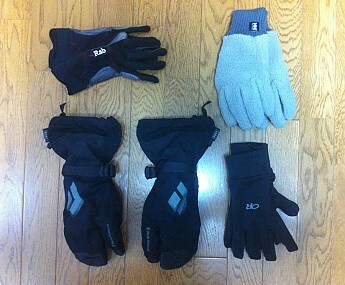 Glove system (clockwise from top left): Rab M14 climbing gloves, Haglöfs really thick pile gloves, Outdoor Research PL 400 fleece gloves, Soloist Lobsters with PrimaLoft One liners inside. 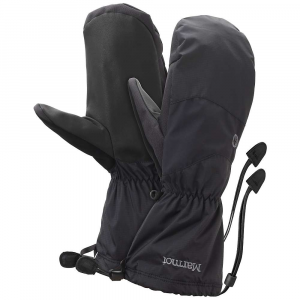 The Soloists are a great 'rain shell' for your glove layering system. The outer shell has a BDry insert that has held up for me until now. The palms and fingers are reinforced with a very subtle goat leather. 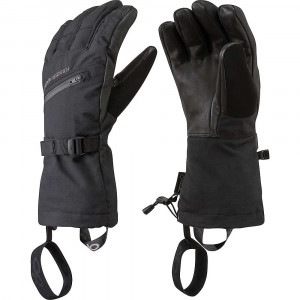 For a base or thermal layer, you can use thin liners, or thicker thermal fleece gloves, or the included PrimaLoft One inner gloves. 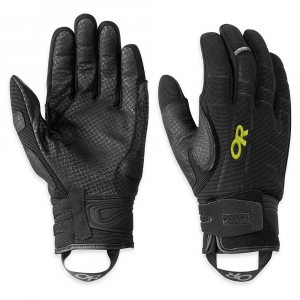 In the winter I like to start the day in a general pretty thin climbing glove (the Rab M14). These have great dexterity and I like to keep these on if the weather allows. If I need more warmth, or it snows a lot, I can put the Soloist outer shell over them. If I need to stop, or it just gets a lot colder, I can exchange the Rab M14 for a really thick 400 weight fleece, or the included PrimaLoft One inner gloves with the Soloist shell over them. This will certainly work for me till roughly -15˚C, but I know of myself that I can suddenly get extremely cold hands, so you might be OK till way lower temperatures. The official rating is -20~-29˚C (10~-12F). My size Large weigh 258 gram total, 156 gram for the shells, and 102 gram for the PrimaLoft One inners. 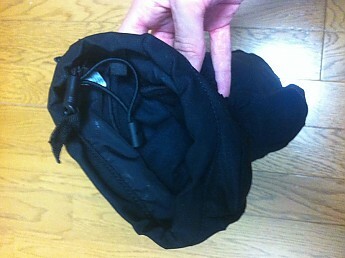 Top: Soloist outer shell. 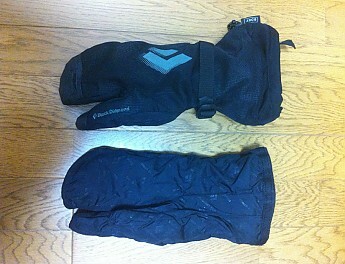 Bottom: PrimaLoft One thermal inserts. These gloves have good space for layering. 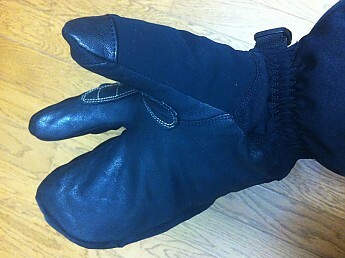 They seem to function well with thinner gloves, as well as with more bulky fleece gloves inside them. They are slightly roomy in the three finger section, causing them not to move with your fingers as well when you bent them. This is the only point I see that could be improved upon. Perhaps the upside to this is that you can layer really thick pile or fleece liners under them, or that you can add your index finger when it’s really cold and use that section as a mitt. The gauntlet was easily roomy enough for me for over my thin fleece base layer and rain shell, and a bit more fiddly fit over a thick down puffy. In both situations it handled fine though. When you want to tighten the glove, you can do so with the wrist strap only, or also with a cinch cord at the hem of the gauntlet. Goat leather palm and fingers. There is also a Black Diamond Guide Lobster, with a GTX shell that has a slightly better fit in the mitt/three finger section for my hands. It is also more expensive. For me the Soloists were more than good enough but it is worth checking them both out before you decide which one to buy. All in all a very flexible glove system that you can add and subtract to what you want. 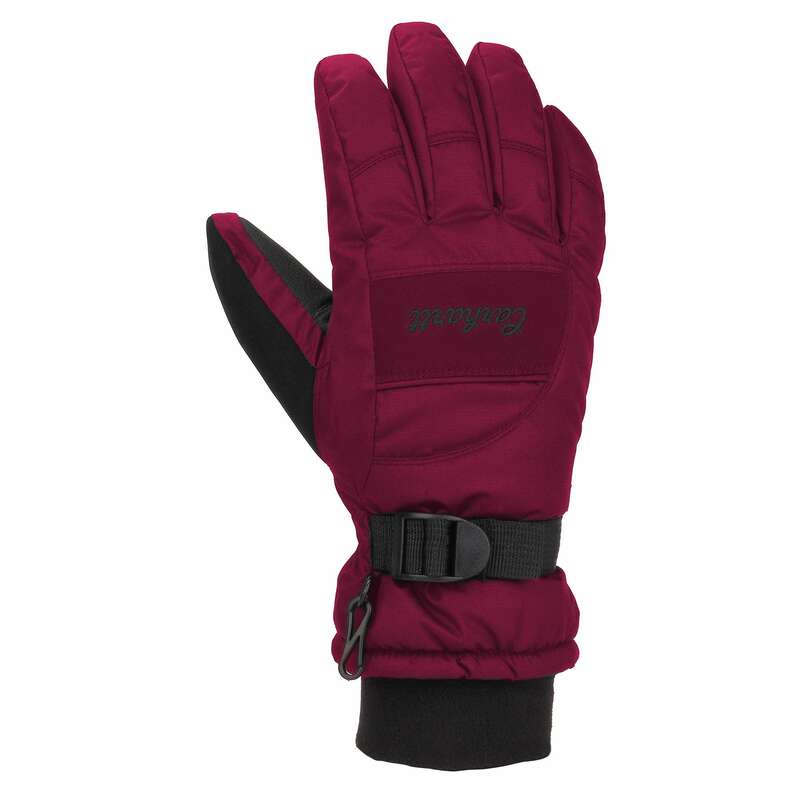 I can take the shells and my normal trekking gloves in the summer to lower or mid Alpine treks and leave the PrimaLoft liners behind if I want to, or I can bring extra thermal layers to ensure I have dry and warm ones to swap out if need be. I use to do winter cycling with lobster mitts. I pulled them out of the moth balls this winter when it was so bitterly cold. Another informative, helpful gear review. Thanks, Jakuchu. I can imagine they must be useful on a bike too yeah. Thanks Alicia, glad to share.